Many of you probably know that Anime Fannatiku in St. George, Utah is my all time favorite convention. Last year the convention announced that it had to skip a year because of a projector that had gone missing and the hotel wanted them to pay for it. Since Anime Fannatiku is so small the bill for the projector made it so they had to postpone the convention. I quite overjoyed when I heard they were returning in 2015 and made sure tickets and everything was in order. 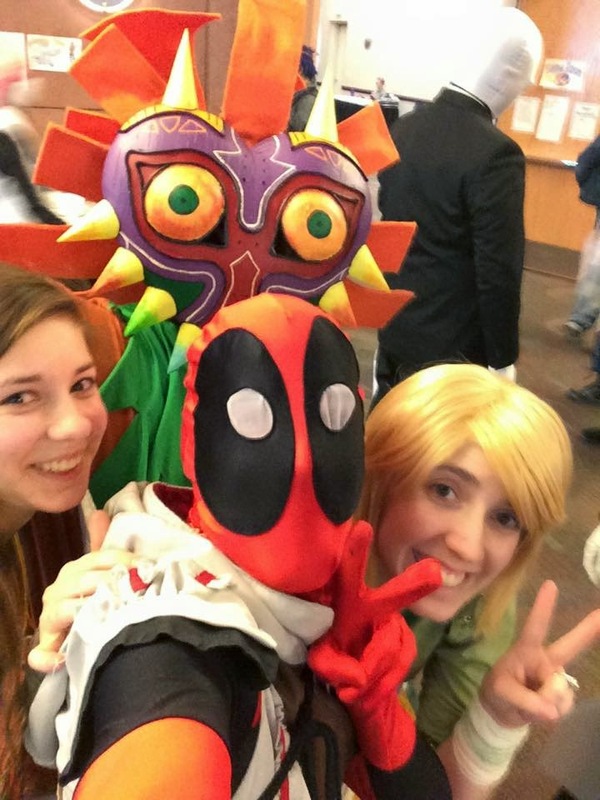 Utah is booming with large nerd conventions like Salt Lake Comic Con, Fantasy Con, and even Anime Banzai is getting really big (Congrats to them because that is awesome!) Anime Fannatiku is much smaller, with about 350 attendees every year. This year they apparently had even more attendees! The convention also moved to the Dixie Convention Center, which was a wonderful location with great panel rooms and easy navigation to events. Even with the two panels I signed up to host, I did not feel time crunches or pressed to hurry to get in line for anything. I love Fannatiku because I can stop and chat with complete strangers for hours and meet new cosplayers on a more personal level. Fannatiku is very friendly and there was never a dull moment for me. with M Stal Kid's Skull Kid. As you saw in the previous post, I did enjoy creating a fake band and running around with M Skalkid Cosplay. I also hosted two very successful panels on Woodcraft for Cosplay Props and Embroidery Tips for Cosplay. I really wish I had taken a picture of everyone gathered on the floor for the embroidery panel because it was so cute! We all sat in a bit of a circle and were all stitching and having so much fun. I also stabbed my finger with a needle. Chatting with pals about swords and stuff after the woodcraft panel. My sister and I did a first. We were king and queen pieces in the cosplay chess game. It was a kind of spur of the moment thing and it was so worth it. My sister was Zelda and a King piece. We chose King for Zelda since she kind of just sits back. I was Sheik and a Queen piece. It was very fun and as soon as I find video from it I will post it here or on Facebook. I danced with slenderman. It was awesome. Lexus ran away from him. There was an epic Slenderman cosplayer. He never broke character and scared my sister. I enjoyed dancing with him in the halls to freak my sister out. We even went "hunting" for her when she decided to hide. On Friday I wore my Ordon Link cosplay and halfway through Saturday my sister switched from Zelda to Ordon (She wanted to climb trees with Sheik and Skull Kid.) Slenderman sidles up to her and whispers, "Where is your sister so I can scare her," and my sister laughs and goes "Right here!" and then she scurried away. Even with that mask on, I think it is understandable Slenderman thought Lexus was me. It was awesome! This is Lexus in my Ordon Link cosplay. She looks just like me!!! Its freaky! The contest was a gem to watch and there was a lot of cool skits and awesome cosplays. I always love the Fannatiku contest because their mascots are actually cosplayed at the event and they are hilarious to listen to. They even brought in Sarah Hall, dressed as Kyoya from Ouran High School Host Club: The dress episode. The banter was perfect and I particularly enjoyed the expression made in this picture at the moogle that was placed on the stand. Plus, look at Sarah's expression, priceless! The biggest surprise was seeing Cassini Closet debut her Bonnie from Five Nights at Freddie's. Delightfully freaky and she removed part of the head on stage. It was perfect! Cassini as Bonnie from Five Nights at Freddie's. I also cheered for my friend Camille, who had never competed before. I had a ton of fun running around and helping her prep for the contest. She is moving soon so I wanted to see her compete since she had expressed an interest. I very proud of her stage performance. She did a mini ribbon dance in her Mami cosplay from Madoka Magika. She won an award for her performance and craftsmanship. Cami super excited about her award. Look at the bags under my eyes. SO TIRED! Scratching the eff out of your head after wearing a wig all day is heaven. Instead of dancing I made some new friends and cannot wait to see what more shenanigans will come in the future! Also, this group was so fun to talk to. I can't wait to do more with them in the future!!! Why did we have to meet on the last night of the convention!?!?! by Haisley. Those two also had a lot in common. A lot of other things that happened as well, like the picture below... and my Facebook album for Fannatiku will slowly fill up with all the fun stories. I just want to say that I was surprised to hear that Fannatiku was going to be making this year their last, but because of the influx of attendees they will be returning next year! I am so glad they can come back again!! your head. Meet the captain of the Hylian Guard!